The only reason I chose to fill through the atf dipstick is because it was already open and right there. 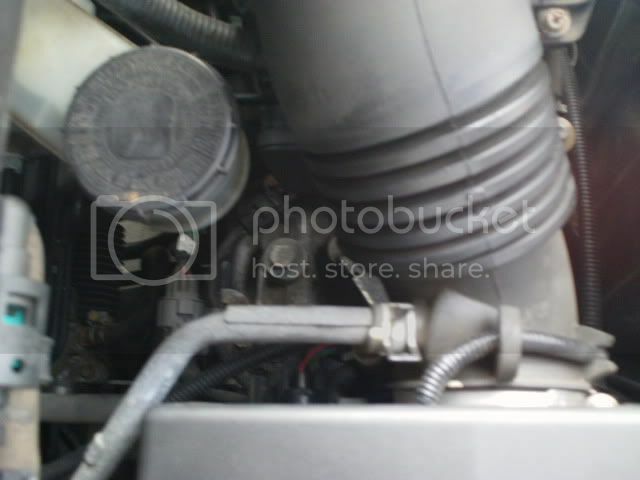 I was hesitant without a ratchet extension to loosen that bolt way down in the engine compartment. Both ways work fine, just take your time and try not to spill the new fluid on your engine. Note that some transmissions(circa 1999-2004) will have had the recall work done, meaning that the fill hole will have been taken up by some other piping and stuff, and in that case the recall instructions state you should fill via the dipstick hole. Just curious what everyone's thoughts about this YouTube video are. The fellow offers what I thought was an innovative idea for the process - don't recall seeing this while surfing through various threads on the subject here. Basically, he drains via the drain bolt then refills with ATF. Then, he hooks a temporary hose to the ATF supply line & directs it to a waste container. He then starts the car and, as the ATF is draining via the supply line, adds new fluid. Once the fluid coming out of the supply line runs clean, he stops the car & tops off the ATF. Sounds like full removal of the fluid, including that difficult-to-reach bit in the torque converter, is possible with this method. As an aside, his car's an Accord & the manual states that the transmission may be temporarily filled with Dexron III. His plan is to flush the old ATF fluid out with Dexron III for half a day, then repeat the flush procedure with Honda fluid. The Dexron III is being used simply because it's cheaper. Now, this seems a purist's approach - the 'flushing for half a day' seems a bit of overkill. To me, if his method is generally valid, simply doing the full drain and replacement of old Honda fluid with new Honda fluid would seem sufficient. I just thought I'd run this up the flagpole to see what the general opinion was on the idea. Last edited by RolHammer; 05-31-2010 at 07:48 PM. i have seen several questions as to how long to run the car between drain and fills while doing a full flush. here's what i did to ensure a full flush. it was more a "do it when i have the time" procedure. after i did my first drain with a clean up on the magnet, i filled the trans back up and ran it for a couple of days back and forth to work. when i had the time again, i drained and filled with another magnet clean up(much less debris on the magnet). i continued this method of drain and fills and drive until i was done and the magnet when i was done was very clean on the last drain. like i said, it was a more out of my own convenience maintenance procedure than anything, but if you think about it, i probably got a great dilution of new and old trans fluid than a one day procedure would have. Analogous (but better) process for flushing than in the YouTube video I linked to. I used the method that was posted by dntboles previously. It was fine for the first flush but the second time (need flush twice based on the instructions) causes my ABS, TCS, BRAKE and Check Engine light all came on. I have disconnected battery for now to see if it will erase all error messages. I have been reading about changing the transmission oil only, but why does no one mention replacing the filter? Is there something I am missing and/or not understanding about changing the transmission filter at the same time of the transmission oil change? The original 5 speed (2002-2006) had a filter that was not deemed "serviceable" by the dealer, but could be accessed and changed if one was reasonably motivated to do so. The 2007+ 5 speed was redesigned and closely related to the heavier transmission developed for the Ridgeline and Pilot for greater towing capacity, but the filter was further internalized and is not accessible without cracking open the case. It's essentially designed to do it's job for a period of time before eventually clogging and simply bypassing which pretty much all transmission and oil filters are designed to do to avoid fluid starving if the filter gets clogged. Some here have opted to install an "inline" filter such as Magnefine to get a functioning filter, so that's an option. Most here, once they are aware and tuned in, are just doing regular fluid changes. Valvoline Maxlife fluid (full synthetic) is a popular option vs OEM fluid which is now DW-1 because of it's ease of purchase at most Walmart stores in a 4 qt jug for ~$18 or $4.50 a qt vs typically $10 a qt for DW-1. Full synthetic for 1/2 the price of DW-1 seems like a win-win and I have been using it for almost 100K miles in my '07. Automatics that I owned prior to the Ody had a removeable pan, inside which was the one and only filter. It was always replaced whenever the ATF was replaced. Honda automatics are different in that they have no pan, just a case. The main filtration is sealed inside the case. The external filter that some years had was just a secondary filter. In addition, it had no specified factory service interval. In fact, most dealers didn't even know it existed. Just to say, I certainly understand your confusion about the ghost-like ATF filter. 97 transmission fluid change; is there a pan?